Portrait of Jagmindald Singh Grewal a Landscaper. Hockey Pitch. LONDON.- E20 12: UNDER-CONSTRUCTION - a stunning visual essay by British photographer Giles Price, which received wide critical acclaim during this years London Festival of Architecture, has been extended to run throughout the Olympics. 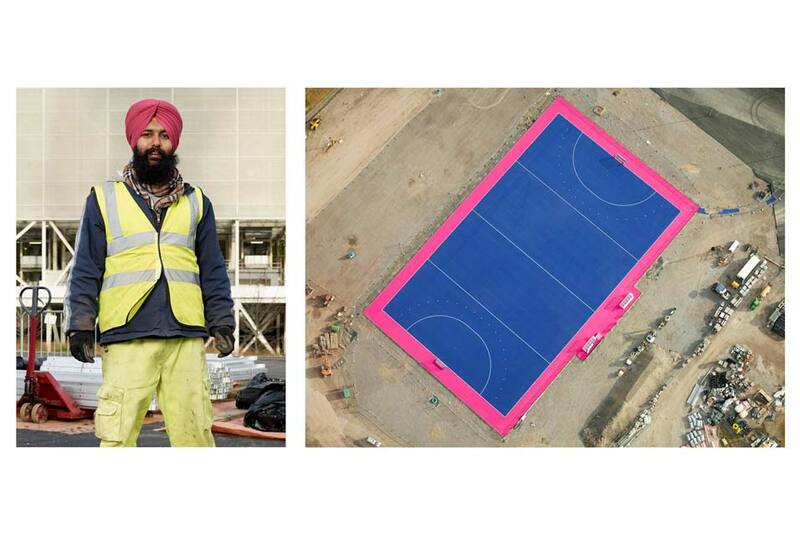 Taken over two years in the run up to London 2012 - and the only set of photographs to document the developments progress in this way - the essay sees Price combine a series of exclusive, large-format and minutely detailed, aerial images of the Olympic Park, with arresting portraits of its workforce. The aerial landscapes are produced with the aid of the latest camera technology and, by pushing the boundaries of the language of satellite-imaging, they allow the viewer to experience a new way of seeing the construction of the site. The extraordinary detail of these images opens up a rare perspective of the development - revealing the intricacy of the build and the overwhelming scale of the sites transformation. Conversely, Prices portraits of the construction workers introduce us to those, often-ignored, characters responsible for delivering the iconic Olympic Park and reconnect us to the human element of this landmark architectural, cultural and sporting project. Together these photographs create a comprehensive, twofold narrative of the rebirth of East London, illustrating the immediate impact of the Olympics and offering an insight into the potential extent of its legacy. In 1990 at the age of 16 he joined the Royal Marine Commandos and served in Northern Iraq / Kurdistan at the end of the !rst Gulf War (1991), during which time he created a snapshot diary, Operation Haven, now stored in the Imperial War Museum, London. After leaving the military due to injuries sustained in Iraq he went on to study a BA Hons in Photographic Studies at the University of Derby. On completing his studies he returned to London and produced / assisted Warren Du Preez & Nick Thornton Jones for 7 years. His own work, including several cover stories, has appeared in numerous publications including the Telegraph Magazine, Guardian Weekend Magazine, FT Weekend Magazine, Independent On Sunday Magazine, Conde Nast Publications, i-D and Big Magazine. He exhibited as part of Simon Foxtons When Youre a Boy retrospective at The Photographers Gallery, London (2009) and his Macroscopic Olympiad project was shown as a solo exhibition at See Studio Gallery, London (2011). His portraits of !rst World War veterans (2004) Johnson Beharry VC (2007) and John Gray (2008) are in the collection of the National Portrait Gallery, London.